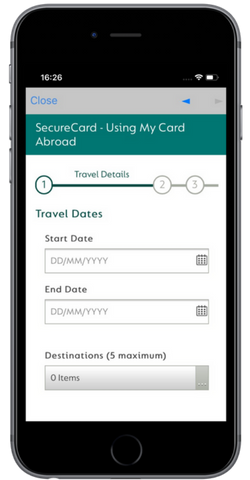 Download our mobile banking app and manage your accounts quickly and easily, wherever you are. Our mobile banking app now supports facial recognition technology for quick and easy authentication. 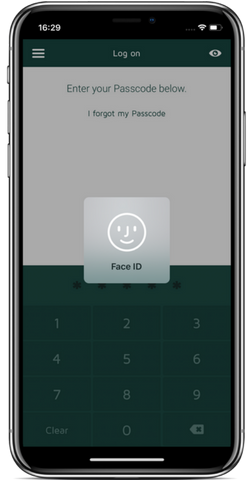 Using Apple’s Face ID functionality, customers with an iPhone X can securely log on just by looking at their handset. Touch ID (fingerprint verification) can also be used to log on to the app on compatible devices, as well as the standard passcode function. View the balances of your Cumberland current accounts, savings and mortgages, wherever, whenever. 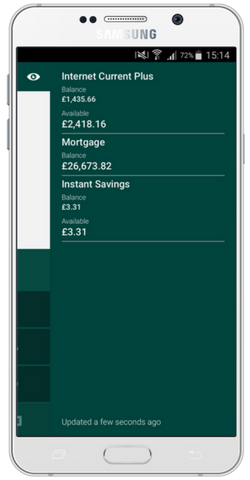 You can also enable our handy Balance Peek feature to check your account balances without even having to log in to the app. Browsing transactions is easy too; you can search for individual transactions, filter them by date, credits or debits, as well as view pending transactions. You can now add new payees in the app and pay them up to £500 (per transaction). No need to log on to Internet Banking. Don't have their bank details? No problem. With Pay2Mobile, you can pay friends and family using just their mobile number. 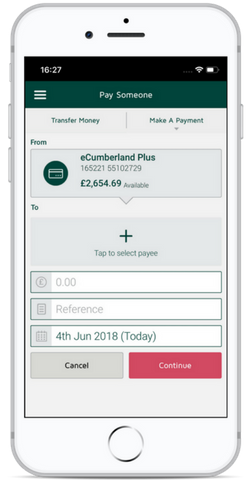 Transferring funds between your Cumberland accounts is also quick and easy - simply go to 'Transfer Money', select the account you want to move funds to and enter the details. Another new feature in our mobile banking app is the ability to view statements. Securely access your last six statements on your phone or tablet. Download a copy, print or email. It's as easy as that. Additional statements are available to view and download via Internet Banking. What else can you do in the app? Visit the App Store or Google Play Store and download the app now! 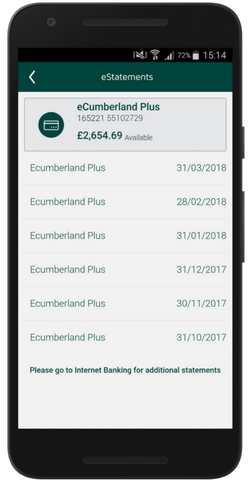 You must be an existing Cumberland Internet Banking customer to use the app and have previously registered your mobile phone number with us. Download the app and select 'Register' from the main menu. Enter your Internet Banking Customer Number and Access Code. We'll then send you a one-time security code to the mobile phone number you have registered with us. Enter the code to verify your device. Finally, you'll be asked to choose and confirm a 5 digit passcode to enter each time you log on. You can also set up Face or Touch ID on compatible devices. Can I download the app on more than one device? Yes, you can download and use the app on multiple devices. Registered devices can be managed via the Settings menu option in the app. Please call our Customer Service Team on 01228 403141 for assistance with changing your mobile number. Apple, the Apple logo and iPhone are trademarks of Apple Inc., registered in the U.S. and other countries. App store is a service mark for Apple Inc. Android, Google Pay and the Google Pay and Google Play logos are trademarks of Google Inc.